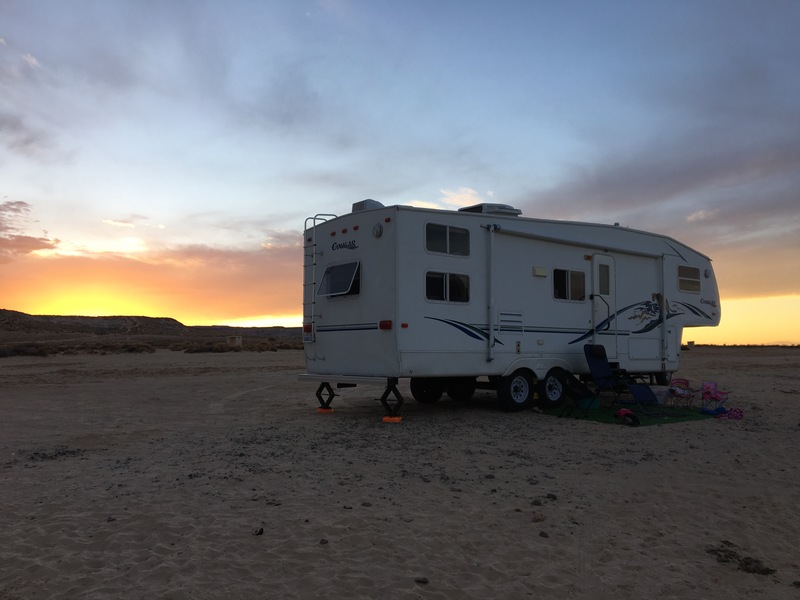 After finally leaving our campground home in Kanab, we were able to find a cheap boondocking location along our route forward. This arrangement is great because it saves us some money, and breaks up the longer parts of the drive. 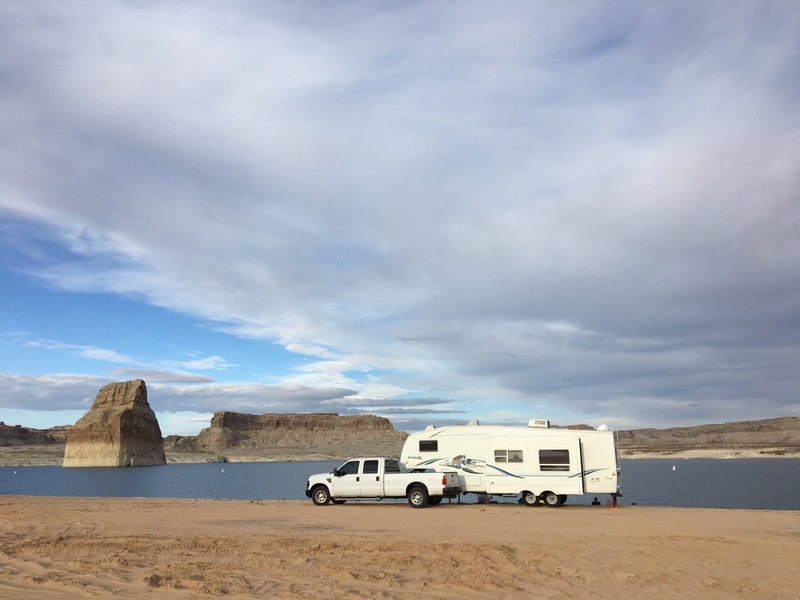 Just about an hour away from Kanab, we camped at a BLM beach along Lake Powell. 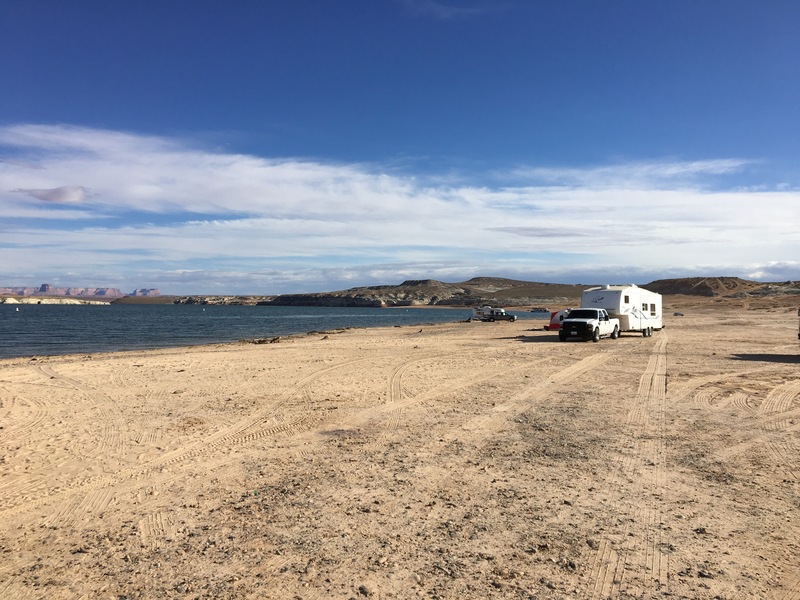 There are no marked sites – so trailers, houseboats, and tents just spread themselves across the beach wherever they’d like. The brushy, sandy landscape that surrounds the beach is cross-crossed with dirt roads to access the beach. We were pretty concerned about getting stuck in the sand, especially since our truck is 2WD, and we had originally planned to park in the large gravel parking lot on the plateau above the beach. But when we arrived there were so many big rigs near the water it gave us confidentce to give it a try. We parked our rig at the top and hiked all over the beach, walking a couple of potential routes to find the one with the least amount of deep sand. So many campers and motor homes have driven the area that there are strips of sand/gravel that have been packed down into makeshift roads, even across the sand. 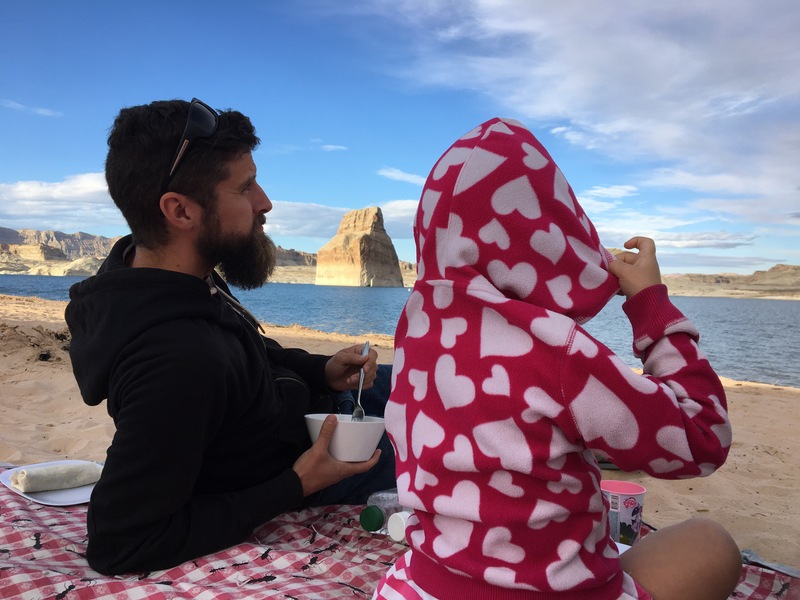 We had also read that the beach is sometimes incredibly crowded, but being there so late in the season and on a week night meant that we would be able to enjoy quite a lot of space between us and our nearest neighbors. So to be honest, I was still pretty paranoid about the sand, but I’ll let you read the ending first – we didn’t get stuck – didn’t even spin our tires pulling in or out. Success! Anytime we are near sand, our girls go into a sort of sand-play induced trance where they play together and indpendently for lengths of time that we never see anywhere else. Brad had some work to do, but we both enjoyed sitting in our camping chairs on the outdoor rug and drinking in the scenery and the calm. It’s amazing to me how similar an experience like this is to our daily life right now, yet these chances to boondock feel like such a break from the norm – a breath of fresh air. I’m tempted to say “a vacation from this vacation”, but our daily life is not really a vacation – we are both still working pretty hard! 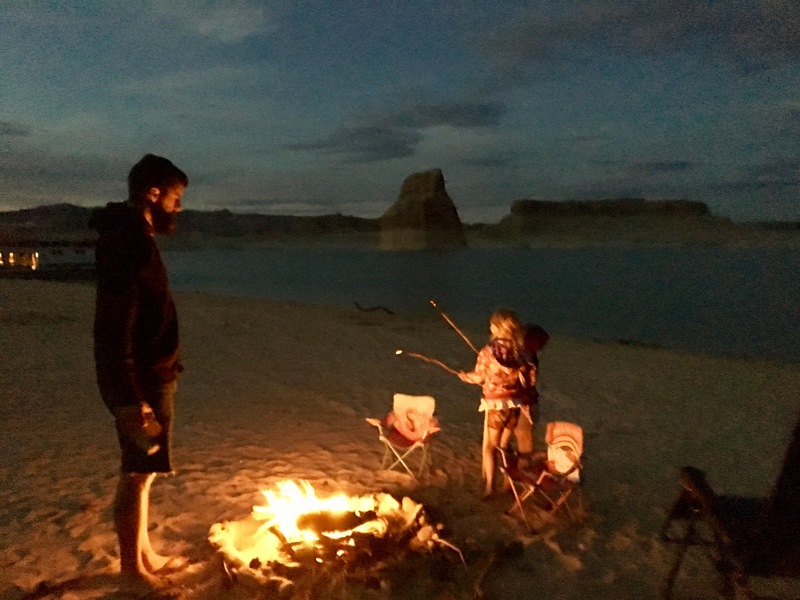 We enjoyed a picnic dinner in the sand and then made a beach fire with a pile of wood and branches that a previous camper had left in a pile nearby. This was actually the FIRST fire we have had on this entire trip! It was such a treat to have a fire with no concern about wildfire risk, which my Washington state mind has become so accostumed to considering. I wanted to sit outside by the fire after the girls were asleep and do some reading, but a party at a nearby houseboat preventing that. I just closed my book and pretended it was my own private concert. The next morning all 4 of us cuddled up in our bed & watched a dazzling sunrise over the lake through the window. It was so great to meet you and talk with you, too! Thanks for following along on our adventures. And good luck on your next adventure in Tuscon, as well! 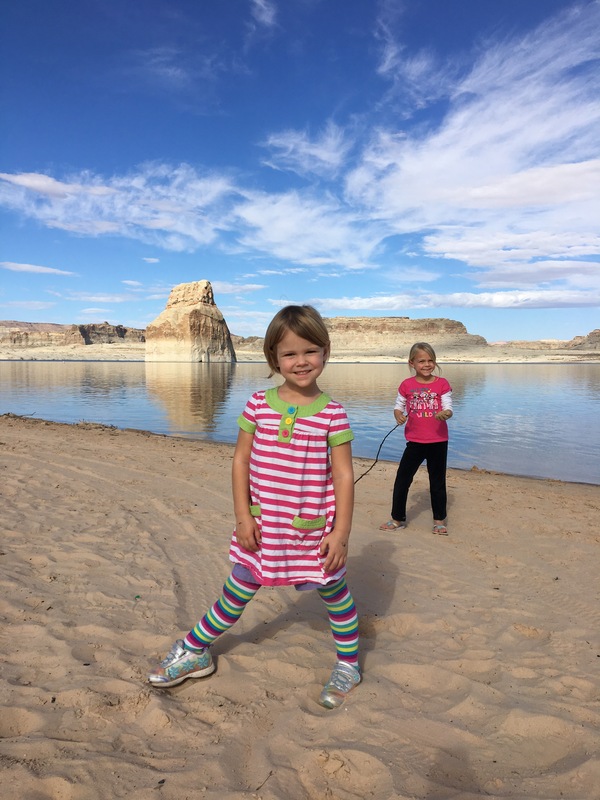 I lived in Pinetop, AZ for 5 years and visited Lake Powell with friends for boating and water skiing. It was pretty primitive tent camping on the sand for us. Did you get to see any of the Navajo or Apache Indian reservations while you were in AZ? I taught on the Apache reservation.